It’s official; the holidays are here! It’s a time for families, friends, fun; shopping, giving, cooking, eating, celebrating, decorating…and that decorating may likely include a variety of seasonal house plants. They’re pretty, festive, colorful and traditional; they are great to enjoy ourselves or to give as gifts. The poinsettia, everyone’s favorite holiday plant, has been falsely accused for a number of years of being poisonous, yet no deaths from this plant have ever been recorded. 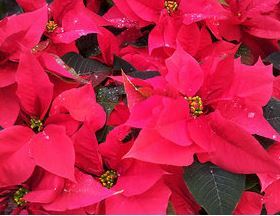 In fact, research studies at The Ohio State University have proven that poinsettias present no health hazard. Do you know which of these other holiday plants are safe? Holly – berries are poisonous; the leaves are not. Mistletoe – its white berries are poisonous. Christmas cactus – is non-toxic. Christmas rose – is toxic. Amaryllis – is poisonous to human and animals. Jerusalem cherry – Every part of this plant contains toxic substances. To be on the safe side, keep holiday plants out of reach of children and pets. Remember to pick up and dispose of all leaves or berries that fall from your plant. Christmas trees are also a problem. The needles, even though they are not poisonous, are a choking hazard. Written by: Kathryn K Dodrill, Extension Educator, Family and Consumer Sciences, Washington County. Reviewed by: Lisa Barlage, Extension Educator, Family and Consumer Sciences, Ross County.